Hi everyone, new in my online shop today is the Craft & Carry Stamparatus Bag which is a great bag to store, protect and transport your Stamparatus. 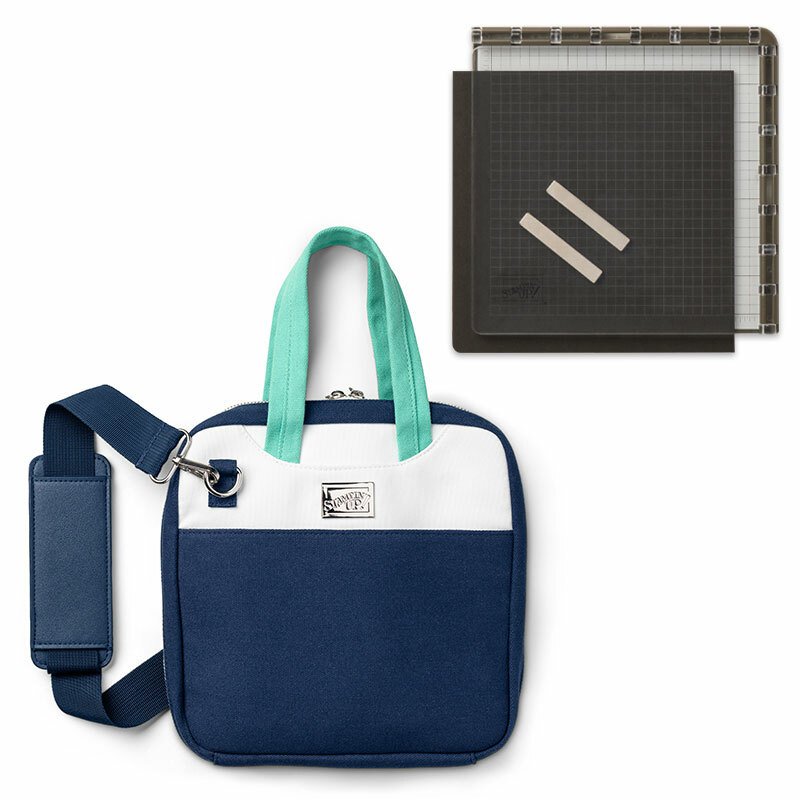 Specially designed just for the Stamparatus, this Craft & Carry Stamparatus Bag is a stamper’s dream. It is sized perfectly to fit the Stamparatus tool. Both absolute must-haves, we’re making buying the tool and the bag together a piece of cake by offering them as a pack. If you use your Stamparatus, you’ll love this handy, portable storage option. With Christmas around the corner, wouldn’t this make an amazing gift?! Hi everyone, the Stamparatus is a must have tool for any stamper. It allows you to do all kinds of different techniques, as well as being a great asset during those times when you need to mass produce your cards. Now, Stampin’ Up! has released some accessories for the Stamparatus which will make the crafting process even easier. 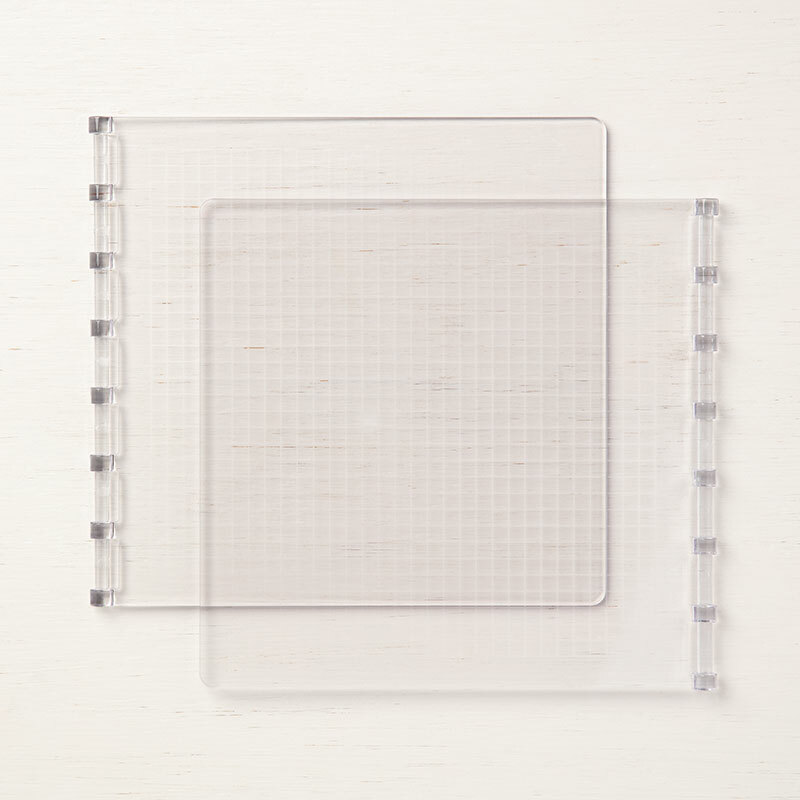 Additional plates allow you to have multiple stamp arrangements ready to go! 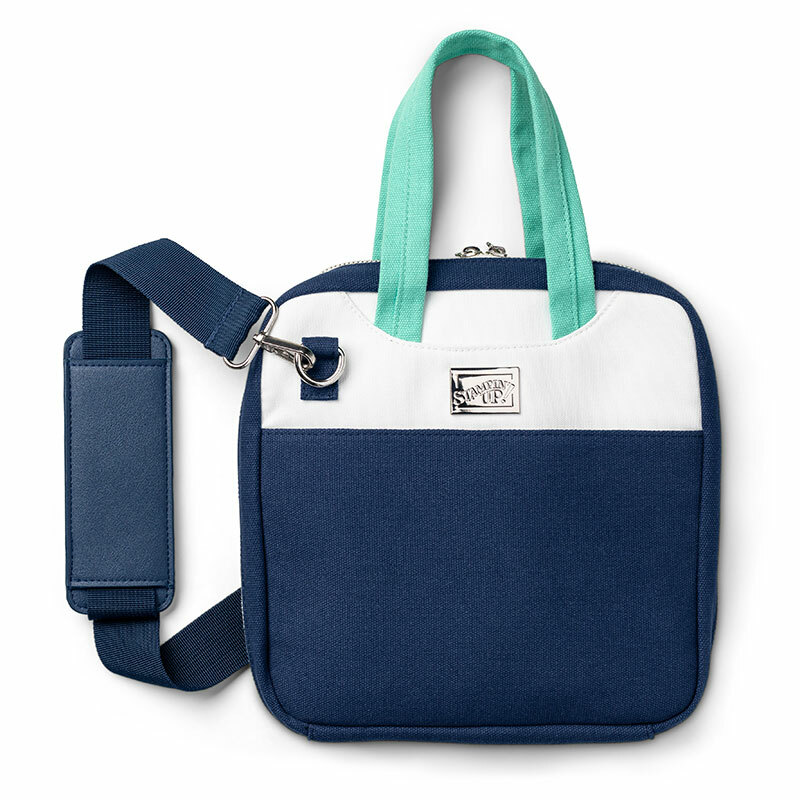 Of course, you can always order all three new items together instead of individually under code 151050. Hi, one of my favourite type of card to create is a scene card. 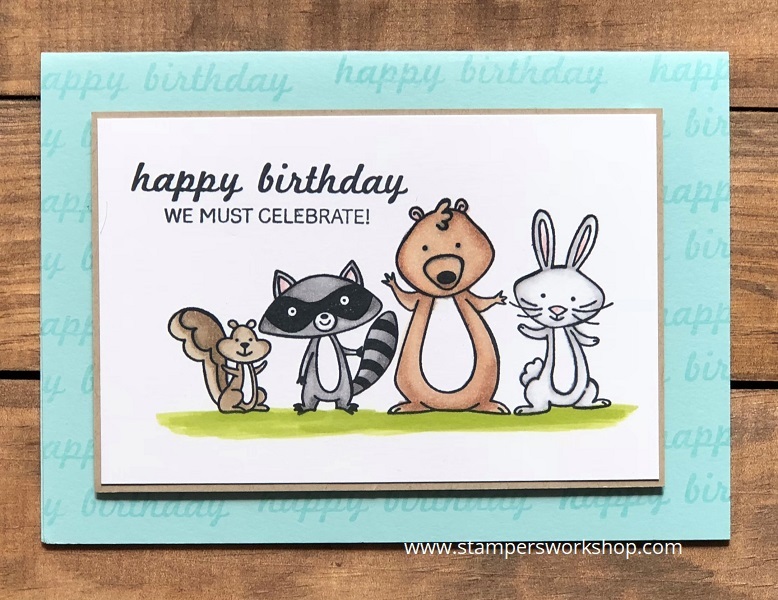 I also love crafting with critters and this is one of the reasons why I love the We Must Celebrate stamp set. 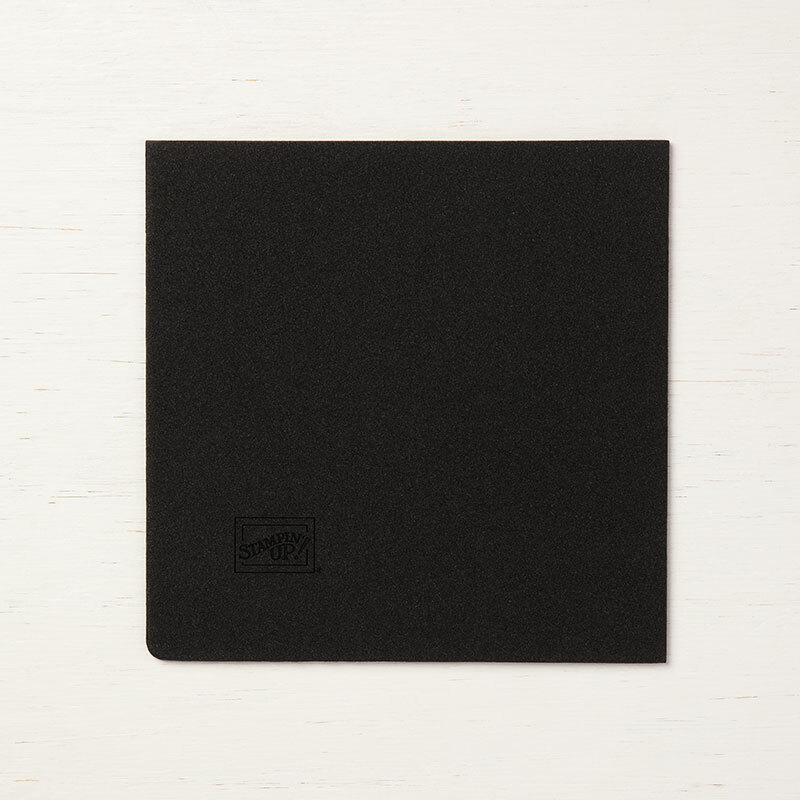 Scene cards are fun for people of any age and can definitely be used for those men in our lives. I know many stampers/cardmakers struggle with making masculine cards so this stamp set might actually fit the bill. Today, I have used quite a lot of products but don’t let this put you off trying it. They don’t really take a long time to create and you don’t need to use all the things I used to create pretty cards. 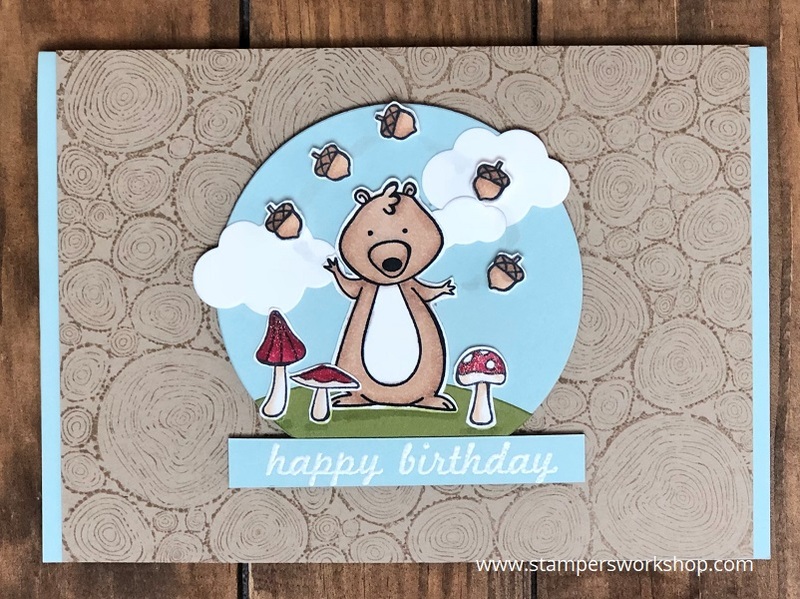 I started by stamping the critters stamp, mushrooms and the acorns in Memento ink before colouring them in using Stampin’ Blends. Just for something different I decided to create my scene on a circular rather than a rectangular shape. I cut out the sky and grass using a circle die from the Layering Circle Framelits die set. I then used the one dies from the Up & Away Thinlits dies to create a little mound of grass for the bear to stand on. The dies from this same die set also were perfect to cut out clouds to add a little more interest to the sky. I used my Stamparatus to stamp the Tree Rings background stamp onto some Crumb Cake cardstock. I used the Stamparatus as it is such a big stamp and I wanted to ensure I had perfect coverage. (Don’t forget every qualifying purchase this month will enter you into a draw to win your own Stamparatus). Next up I assembled all the bits and pieces together to end up with the card below. I love that you can use the critters in the stamp set either as one piece as the stamp set was designed, or you can cut them up and use them separately. Offers way more scope for using the stamp! Do you like creating scene cards too? Hi, today’s card features a stamp set which I cannot believe I haven’t used until now as it is so very cute! The We Must Celebrate stamp set was one which immediately went on my ‘must-have’ list when the Occasions catalogue was released. I love all the cute critters and the extra little details so you can create a range of different scenes for different occasions. The other thing which I really like about this stamp set is that some of the sentiments come from a multiple person perspective. I thought the sample card in the catalogue was really cute and was the inspiration for my card. I really wanted to whip up a quick and easy card where the critters were the feature. I also really wanted to give my Stamparatus a workout so I used it to stamp the background. It made it soooo fast! Now, as much as I love the Stamparatus, and believe me I love it, it is not a miracle worker so if you position the stamp crookedly – that is how it will stamp. You can test out the stamp position before you commit to it on your project if you aren’t 100% sure you have it in the right place. I also used the Stamparatus to ensure the stamped image was super black – especially for the racoon. It was so easy to stamp a layer, ink and re-stamp. It did this about three or four times. I cannot wait to play with this stamp set some more and use a few more of the elements. I also think I will be creating many more backgrounds using this technique in the future. I love it – and now, with the Stamparatus, it is so much easier! Don’t forget you don’t have to use all the critters at the one time. You could always mask some out of the scene, or cut out the critter you want to focus on. This stamp has a huge scope for variation. Hi, Yes! You read that correctly! SURPRISE! I am giving away one Stamparatus to a lucky customer. I was fortunate to receive an extra Stamparatus and I would love to give it away to one of you! The Stamparatus retails for $85.00 and won’t be available to buy until the 2018-2019 Catalogue is released on 01 June 2018. Here’s your chance to get one earlier! It’s super simple to enter to win this prize. For every $90.00 order you place with me on my online store you will automatically receive one ticket (not an actual ticket) to go into the draw. If your order is $180.00, you will receive two tickets, and so on. If you join my team, you will receive 5 tickets. This giveaway is only open to residents in Australia who purchase through my online store or join my team. Tickets are awarded after each order is received and are not accumulative. So, f you place an order for $100.00, you will receive one ticket. If you, later in the month, place an order for $80.00, this will not qualify for another ticket. However, if you place another $90.00 order, this WILL qualify for a ticket. 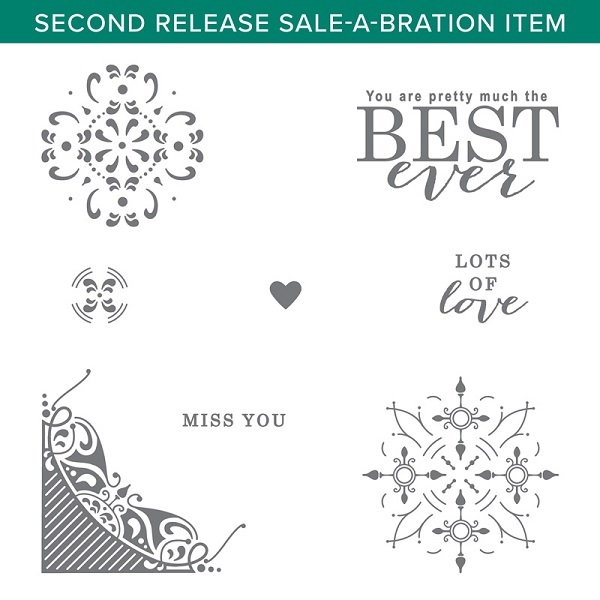 Please note, Sale-A-Bration rewards apply to all orders over $90.00 so you will also be able to pick a free item (or more, depending on order size) as well as going into my Giveaway. No, you will not receive a physical ticket. I will keep a spreadsheet of all tickets awarded and will use this for the drawing. You can check with me at any time as to how many tickets you currently have in the giveaway. How long does the does the competition run? The giveaway is open to all of my customers who place qualifying orders (refer above) or join my team, between 1st March 2018 and 31st March 2018. I will do the drawing on 1st April, 2018 and notify the winner by email (so please make sure your email address is correct when ordering/signing up). I will also post the details of the winner on my blog on the 1st April. The prize will be mailed during the first week of April. 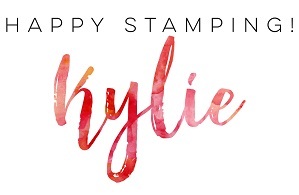 Please note: this giveaway is run by me, Kylie at Stampers Workshop and is not endorsed or associated with Stampin’ Up! December has flown by, and there are just a few days left for you to reserve your Stamparatus before the final reservation window closes on Sunday, 31 December at 5:50 PM (AEDT). Remember, this fantastic, state-of-the-art stamping tool will not be available again until the new annual catalogue goes live in June. So don’t wait another minute! Find out more here, then reserve your Stamparatus today! The Year-End Sales Event with its special year-end savings ends on 2 January 2018. Don’t forget supplies are limited, so take one last look at the items still available in our online store. Don’t head into the new year with any regrets! Hope you all have a happy and safe end to 2017 and I look forward to seeing you all in the new year with lots of fantastic card ideas and information! Thank you so very much for your support in 2017! Hi, your next opportunity to reserve the brand new Stamparatus is here! Things have changed a little since my first announcement about the Stamparatus. The first Stamparatus reservation window reached its maximum number of reservations in just 15 minutes!! Yes, that is right! 15 minutes! Based on the speed of the sellout as well as feedback from Demonstrators and Customers alike, Stampin’ Up! has made some very important adjustments to the reservation process. The second reservation window will remain open from 6–31 December; however, during this reservation period, Stampin’ up! will take as many orders as they receive (yay!) and not close the window until 31 December. So whether the total number of reservations is 100 or 100,000, the window will stay open! 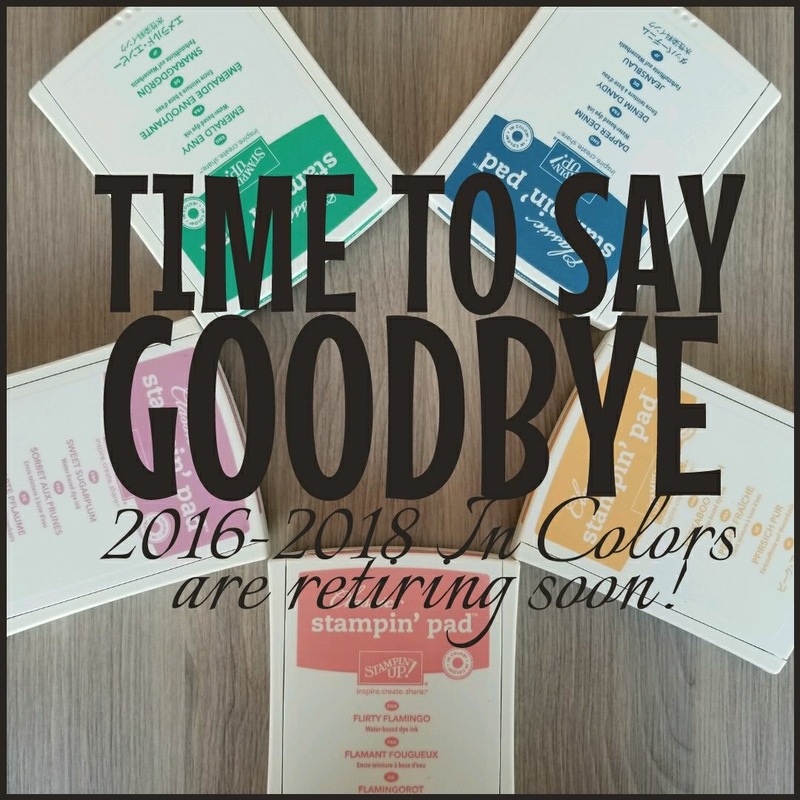 Beginning 19 March, Stampin’ Up! will ship Stamparatuses in the order the reservations were received (first in, first out) and continue through the next few months and beyond as product arrives in the warehouse. Because shipment dates are based on manufacturing lead times, not all of the reservations made during the 6–31 December window will ship on 19 March (as was previously announced). Because Stampin’ Up! is not limiting the maximum number of reservations for the second window, a third reservation window will no longer be offered. This is the last chance for you and your customers to reserve a Stamparatus before it becomes available in the 2018–2019 annual catalogue. The reservation window will open at 8:00 AM (AEDT) on 6 December. RESERVE yours now at my online store. What is the Stamparatus? 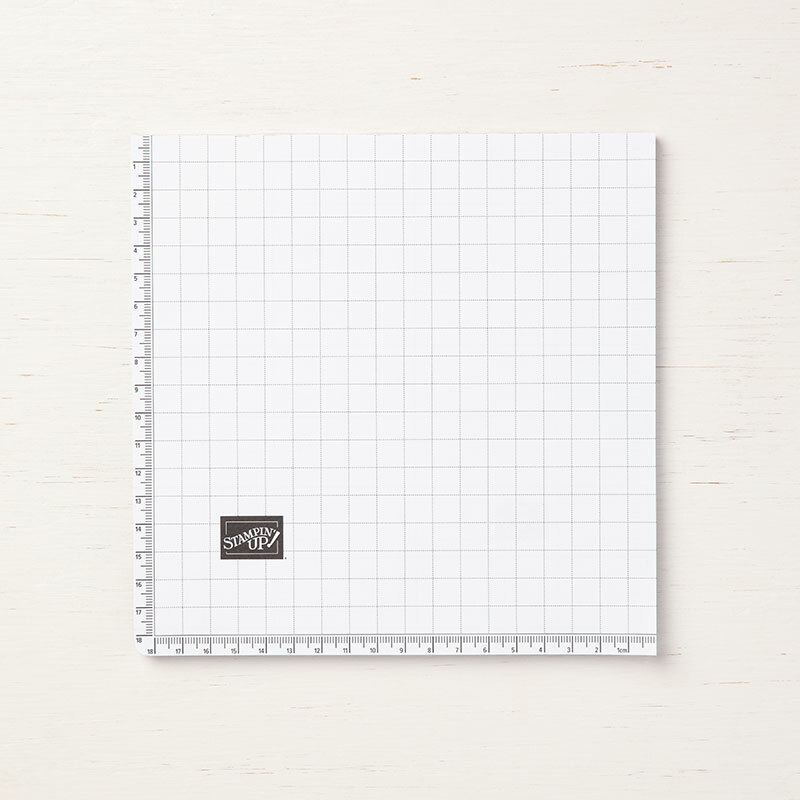 A fabulous must have stamp positioning tool. Take a look at the video below to see it in action. So how do you get one? You need to RESERVE one (credit card is required). A: We will place an order with the manufacturer based on how many reservations are made during any RESERVE given reservation window. Shipping dates depend on how long it takes the order to arrive in our warehouse after the tools have been manufactured. A: When inventory arrives in the warehouse, we will add your reservation to a shopping cart. We will then send you an email notifying you that your Stamparatus order is ready. Once you finalise payment and close your order, the system will charge your credit card. A: Yes. Once the annual catalogue ordering period begins, you will How to Reserve Your Stamparatus Tutorial for Customers PDF be able to order the Stamparatus as you would any other product. Reservations will no longer be required, and there will be no limit on the number of tools you can order. Q: Can I participate in all reservation periods? Hi, the day we have been waiting for is now here. The first opportunity to reserve the brand new Stamparatus! RESERVE NOW for the 17-30 November 2017 reservation window with delivery on or around 1 February 2018. The reservation window opens at 8:00 AM (AEDT) on 17 November. Preorder quantities are limited. Isn’t this great! It is such a well-designed tool and I’m really looking forward to securing my own! 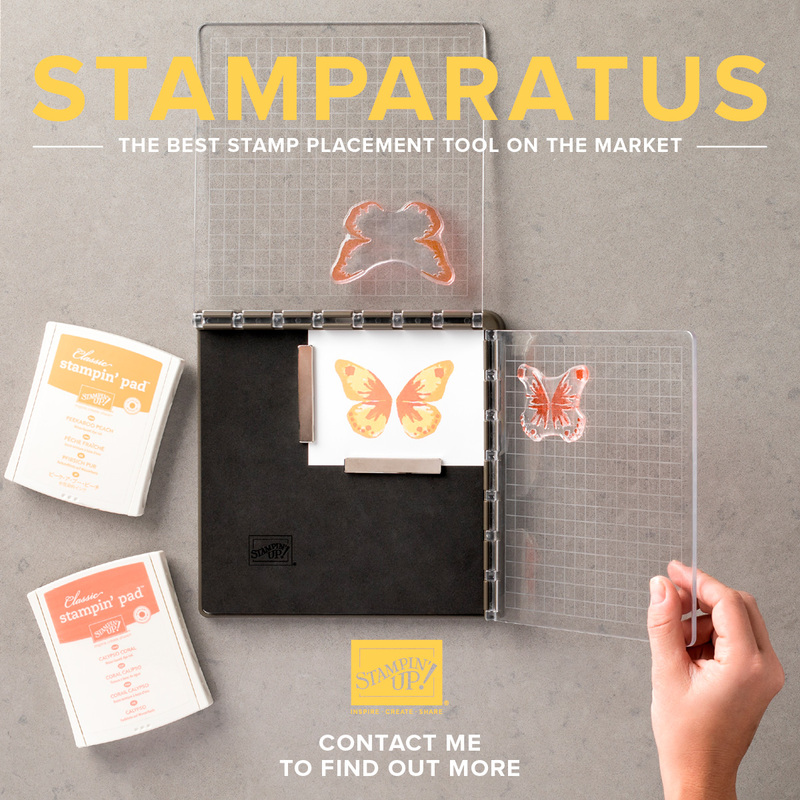 Whilst there are customer limits of one (1) Stamparatus, if you think you *may* need more than one, consider becoming a Stampin’ Up! Demonstrator as we are permitted to reserve three (3)! So awesome!